 yoga gift ideas for the practicing yogi for those with yoga experience. This kit contains the tools to begin or advance your yoga practice. The Tapas® Sticky Mat provides you with a non-slip surface, the block adds support to many of your postures and the strap helps you to extend your flexibility. The kit includes a 45-minute instructional video. 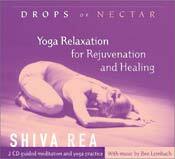 As a complement to one’s existing yoga practice  or used on its own  Drops of Nectar will serve as valuable resource for anyone seeking to explore the healing traditions of yoga. 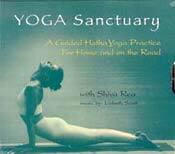 Shiva Rea teaches yoga at workshops and retreats worldwide. She has studied many forms of yoga and dance in India, Africa, Nepal, Jamaica, and Bali. She is a well-known contributor to Yoga Journal and holds an MA in Dance from UCLA’s World Arts and Cultures Program, where she also teaches. One of the great pleasures of yoga is the relaxation session or shavasana traditionally offered at the end of a class. When taught skillfully, shavasana invokes the flow of energetic "nectar" down the spine to permeate the entire body with blissful energy. Finally, a mat bag that works as hard as you do. You won't find a better designed yoga bag anywhere! This one-of-a-kind bag has it all from an easy-to-use zippered pocket that runs along the bottom of the bag to store your mat separately, a main compartment large enough to house blocks, straps, clothing and more, and an interior pocket for your valuables. There's also a roomy outside pocket with a divider, an easy to access cell phone pocket with a security flap, a water bottle pocket, an adjustable shoulder strap and a comfortable padded handle for your convenience. Features heavy-duty zippers and beautiful crinkle-pattern nylon fabrics that are durable and stylish. Master Charles Cannon, The Modern Mystic and meditation master, is the originator of The Synchronicity Experience, author of The Bliss of Freedom and The Synchronicity Experience Practical Spirituality.... Holistic Lifestyle and is The Spiritual Director of Synchronicity Foundation International. He is an acknowledged pioneer in the application of precision, scientific technology to the ancient art of meditation and conscious living. He remains on the cutting edge of research and development in this modern approach to integrative wholeness and human fulfillment. 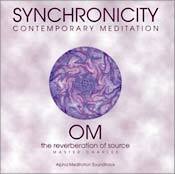 Synchronicity soundtracks are used by hundreds of thousands of people worldwide. The first complete hatha yoga class offered on compact disc, Yoga Sanctuary is the most flexible, convenient tool ever devised for self-directed practice. Thanks to CD technology, the exercises can be cued in any order or combination to create customized sessions suited to your individual needs. Ideal for both experienced beginners and advanced practitioners, Yoga Sanctuary includes a detailed, study guide illustrated with over 110 photographs. Master teacher Shiva Rea guides you through seven "solar" sequences designed to energize and strengthen, and six "lunar" exercises for deep release and relaxation. With graceful, original music perfomred by Lisbeth Scott. Includes study guide and poster. Combining the cool smoothness of silk and gentle weight of flax seeds, flax seeds and herbs or plastic beads, eyebags help release tension around your eyes and brow. A convenient zippered opening allows you to remove the contents and hand wash the silk bag. The cylindrical shape of our neck pillow with its buckwheat hull filling molds to the shape of your cervical spine to give nurturing support. 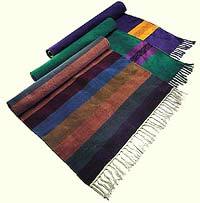 The removable outer cover is made from cool, breathable silk and is hand washable. This is not a book for seekers of a quick self-help fix; Farhi points out "the ancient science of Yoga does not pretend to be simple, quick, or easy." Rather, it's for readers interested in learning about the origins of yoga and using this deeper understanding to bring slow improvement to mind and body. Slow is an operative word  there's even a chapter on slowing down, which is the "precursor to yoga practice because this simple act allows us to consider our thoughts, feelings, and actions more carefully in the light of our desire to live peacefully." Other chapters address becoming one's own teacher, trusting what one does not fully comprehend, and getting through roadblocks (such as sloth and feelings of inadequacy) on the path to enlightened living. The first yoga text to outline a step-by-step sequence for developing a complete practice according to viniyoga  yoga adapted to the needs of the individual. This new edition adds thirty-two poems by Krishnamacharya that capture the essence of his teachings. This woven cotton yoga rug will absorb your perspiration and help you maintain your poses. It is popular for Ashtanga and Bikram yoga. We recommend using one of Hugger-Mugger's Tapas® Basic or Original Tapas® mats under your rug to keep it from moving on the floor. 100% Cotton 28" x 74"
For discount and designer yoga clothing, see our Yoga Clothes Store Directory.